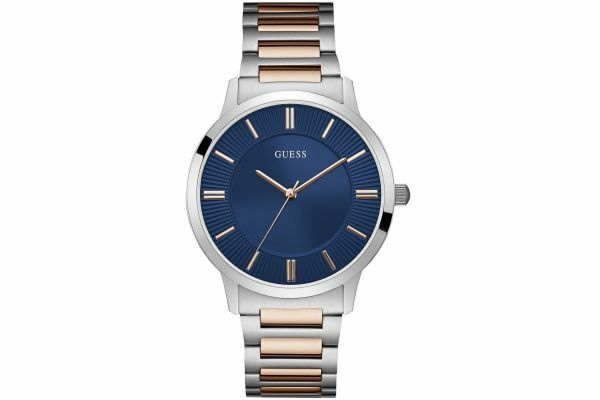 This striking men's watch is brought to you by Guess as part of their new Escrow collection an dfeatures a stunning polished 44mm stainless steel case and bezel. Housed underneath protective mineral glass lies an alluring deep blue split level serrated dial which is enhanced by the applied rose gold hour markers and simple stick hands. Set upon a two tone stainless steel link bracelet with rose gold plated centre links, the Escrow watch is minimal yet classic in its design. Powered by Quartz movement and water resisitant to withstand rain and light handwashing, this suave watch comes complete with a two year guarantee and offical Guess packaging. For us to size your new Guess Escrow watch as accurately as possible, please take a look at our downloadable Watch Sizing Guide.